“Progressive” and “sludge” are not words that you usually hear together, but Richmond, Virginia’s Inter Arma have almost singlehandedly joined the two in metal’s lexicon. Sky Burial, their second album, burst upon the scene in 2013 and was critically lauded, landing on many Best of the Year lists. A follow up EP, a single 45-minute long song entitled The Cavern, showcased Inter Arma’s experimental reach and cemented their status at the top of a new subgenre. To say that Inter Arma are hard to categorize is an understatement. The most obvious musical elements are the dense, heavy riffs of sludge and a tempo that ranges from a dirge to a blastbeat and to everything in between. 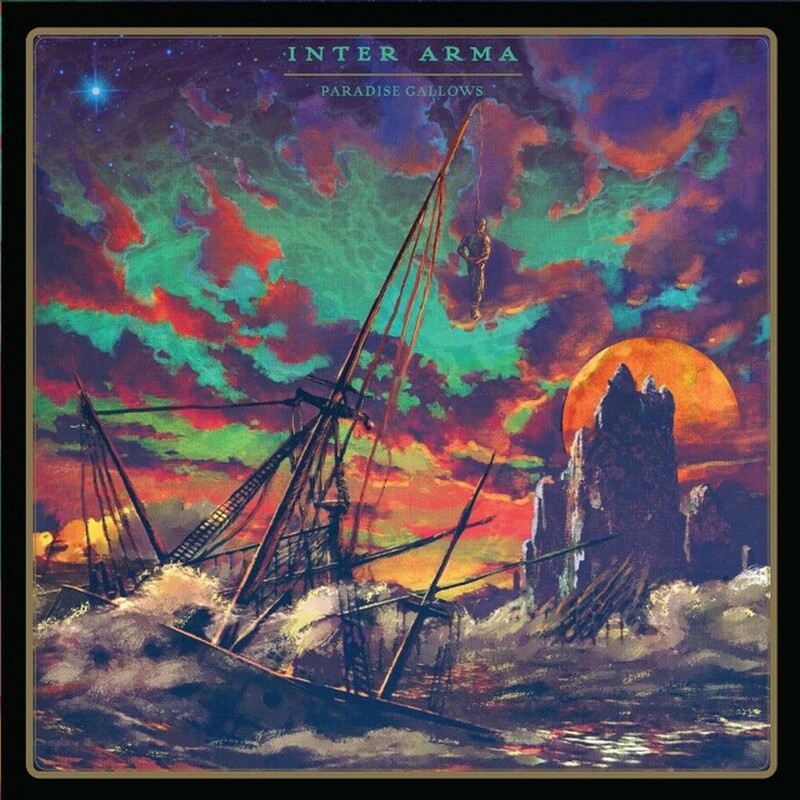 But, Inter Arma also reveal a fascination with classic and progressive rock with acoustical guitars, fluid solos, and the piano. Huge spaces open up within the music with droning riffs that sprawl for long minutes, introducing post-metal and drone to an array of songwriting components. The vocals from Mike Poparo, ranging from a muted roar in the background to a few shrieks, perfectly complement the instruments, giving Inter Arma a haunting, cavernous sound. The approach is not just effective and original, but is perfected on Paradise Gallows. The album continues Inter Arma’s approach with a seamless mix of sludge, cavernous post-metal/drone and pleasing guitar solos evocative of David Gilmour, a seemingly obvious influence. A short intro gives way to the giant sound of “An Archer In Emptiness” with a few blastbeats and some heavy riffing, elements that continue into “Transfiguration.” However, Inter Arma downshift into drone and the cavernous spaces of post-metal with the one two punch of “Primordial Wound” and “The Summer Of Drone,” two highlights that set the stage for the rest of the album. “Potomac” provides an instrumental interlude with piano, strummed guitars, riffs, and a solo overlaying a dreamy, slow pace that sounds straight off of a mid-period Pink Floyd album. “Potomac” segues nicely into “The Paradise Gallows” with strummed guitars, harmonics, and a muted vocal delivery, giving way to heavy riffing and roaring vocals, building to a crescendo, and then slowly fading. Two more tracks follow, the rather jangly and dissonant “Violent Constellation,” and the quiet, introspective “Where The Earth Meets Sky,” two songs that neatly encapsulate Inter Arma’s approach of varied songwriting and different musical elements. With Paradise Gallows, Inter Arma have crafted an album that draws in the listener. Songs reach an emotional high in increasingly varied ways, and keep the listener guessing and engrossed. These are rare qualities, and bands that possess these qualities usually defy convention.